Coverage: Live on BBC One Wales & S4C, BBC Radio Wales, BBC Radio Cymru & BBC Sport website and BBC Sport app, plus live text commentary. Wales' top players, including captain Alun Wyn Jones, have met with Welsh Rugby Union (WRU) to discuss changes to the domestic structure. That happened in the middle of the Six Nations as Wales attempt to win a Grand Slam. "It is not ideal," admitted Howley. Plans for change from the 2020-21 season, which is part of the Project Reset policy, include a possible north Wales region and reducing professional sides in south Wales from four to three with the potential of two merging or one disappearing. WRU chief executive Martyn Phillips met with the Welsh Rugby Players' Association (WRPA) and senior players on Tuesday and confirmed there would still be four regions but the geography was not decided. There had been talks over a possible merger between Ospreys and Cardiff Blues for next season which emerged last Friday, just 24 hours before Wales defeated England in the Six Nations. That prospect was later dismissed. "I am saddened," said Howley. "I only heard it through the grapevine on Friday night and Saturday morning. It shows how much the players were task orientated in the job they did against England. "It's uncertain times, which is disappointing. There's a lot of frustration, not only for the best players in Wales but for their mates in the regions. "There's an uncertainty about Project Reset and they would like to know where they are going to be playing next year or in two years. At this moment in time, that's the frustration and I agree with it." Phillips addressed the players following a request for clarity and consultation by WRPA over ongoing discussions about the future of Welsh rugby. "It's not ideal but we respected the players' view they needed to find out information and garner as much as they can," said Howley. "It was an opportunity for the players to ask questions which might help their friends back in the regions understand what's going to happen in the next six to 12 months. "The players give everything for their country. You feel for the players who aren't here, who are in their regions, and are uncertain whether they have work next year or not. "They have got mortgages, families to look after, and it's not a favourable place to be." High-profile players in the Wales squad who will be out of contract include captain Jones, Rob Evans and Gareth Anscombe. 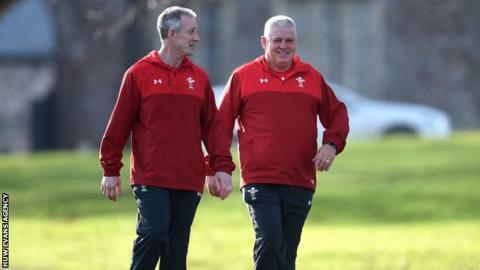 Howley says the coaches do not feel the issue will be distraction as Wales attempt to defeat Scotland and Ireland and clinch a Grand Slam in Warren Gatland's final Six Nations in charge. "We have got a senior players group and their energy and focus has been unwavering," said Howley. "You can see the players are solely focused on doing their best, which is a challenge for them. "We understand that. You respect their honesty because there is a frustration because their mates might not have a contract or how many regions there will be, Who knows?"